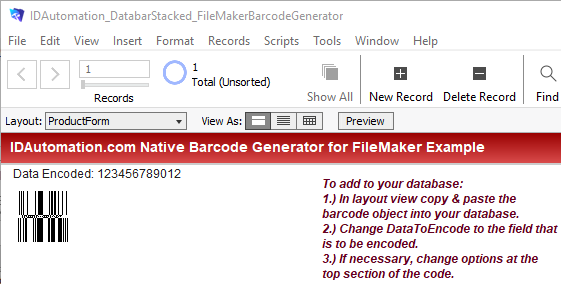 Introducing a new release of the GS1 DataBar Native Barcode for FileMaker Pro and FileMaker Go versions 12 & up. This symbology is used for generation of GTIN and coupon code barcodes, as well as, most POS System barcodes, including DataBar Omnidirectional, DataBar Stacked Omnidirectional, DataBar Expanded & DataBar Expanded Stacked. * This product requires FileMaker Pro Advanced to embed the object within the database. For more information, visit https://www.idautomation.com/barcode-components/filemaker-native/. To buy now, visit https://www.idautomation.com/cart/GS1-DataBar-Native-Filemaker-Barcode-Generator-P12493.aspx.